I always enjoy singing along with Christmas carols! You can feel the warmth and love of Jesus when you sing lyrics like, “Hail, the heaven-born Prince of Peace! Hail, the Son of Righteousness! Light and life to all He brings, risen with healing in His wings. Mild He lays His glory by. Born that man no more may die! Born to raise the sons of earth! Born to give them second birth!” (Hark The Herald Angels Sing) Christ will fill you with joy when you praise Him! One of my favorite memories now that I am older is when my dad used to read us about the birth of Jesus on Christmas morning. One of my favorite memories now that I am older is when my dad used to read us about the birth of Jesus on Christmas morning. When I was young I thought it was a nice story, but now I have memories of my dad that will last a lifetime. Try it this year if you don’t already. Tell your family about the birth of Jesus by reading the Word of God! When you are done, hug and kiss your kids and spouse and tell them how thankful to God you are for having them as a blessing in your life. 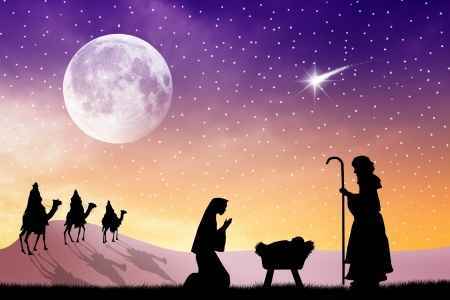 “Religion that is pure and undefiled before God, the Father, is this: to visit orphans and widows in their affliction, and to keep oneself unstained from the world.” (James 1:27) The message of Christmas is that our Savior was born. We need to “go tell it on the mountain, over the hills and everywhere! Go tell it on the mountain that Jesus Christ is born!” (Go Tell It On The Mountain) Take some time to visit the elderly and orphaned. They need love more than ever. It gets so lonely for those that have no one left here. Go love on them! Tell them about the birth of Jesus! Related Reading: What Did Jesus Say About The Poor? This sounds simple. But laugh often! Laughter can bring joy out in others. You know what I mean. When someone starts laughing, others usually follow. God gave us emotions like laughter and joy, so spread them around like a wild fire! You never know, you may spark a question out of someone about why you are so happy. You and I know it is Jesus, and this is a perfect time for seed planting! Movies like “A Charlie Brown Christmas” from above are a great way to keep Christ in Christmas. You get to hear the story of the birth of Jesus in that one! Snuggle up with your kids and spouse as you watch the movies. Another classic is “How The Grinch Stole Christmas”. There is that line at the end talking about Christmas that says, “perhaps it means a little bit more.” This is a great chance to talk with your family about what that “little bit more” is, in Christ! For some, Easter and Christmas are the only days they step foot into a church. God may use you to be His light to the lost. Ask that person that God has placed on your heart for quite some time to come to church. Do not delay! You may be their only reason to go to church and tomorrow may not come for them. Don’t let this Christmas pass without inviting the lost to church. They may receive Christ because of your love. Our church does an “Angel Tree” every year. Every angel on the tree has the children of a man or woman in prison on it. You take an angel off of the tree and go buy the gifts that the children have wished for. Then, our “Christmas Elves” drop off the gifts and say that they are from mommies and daddies that are in prison. The children’s faces light up when they see a gift from their mommy or daddy that they miss so badly! This all stems out of love. “So now faith, hope and live abide, these three; but the greatest of these is love.” (1 Corinthians 13:13) Spread some love to the needy and they will see Christ in you. Take a day where you can spend some time with one of your brothers/sisters-in-Christ. We are called to love one another too! Take them out to lunch and pay for it because you love them. Let them know that you thank God for them often and that they are a reason this Christmas is that much brighter! Jesus is found where true love is expressed, so tell those you love that you love them! Above everything else this Christmas, don’t let it pass you by without recognizing the most important part of it, Jesus. The presents, Christmas cookies, movies and hoopla don’t matter if you leave Christ out. So, keep Christ in all you do this Christmas and shine your light for all to see! God bless you all as you live a life worthy of the calling! Superb advice my brother. Thank you. It’s all about Him and nothing more. Thank you for bring our focus back to Christ. Previous post: Why Did Jesus Have To Die? Couldn’t God Just Forgive Sins?